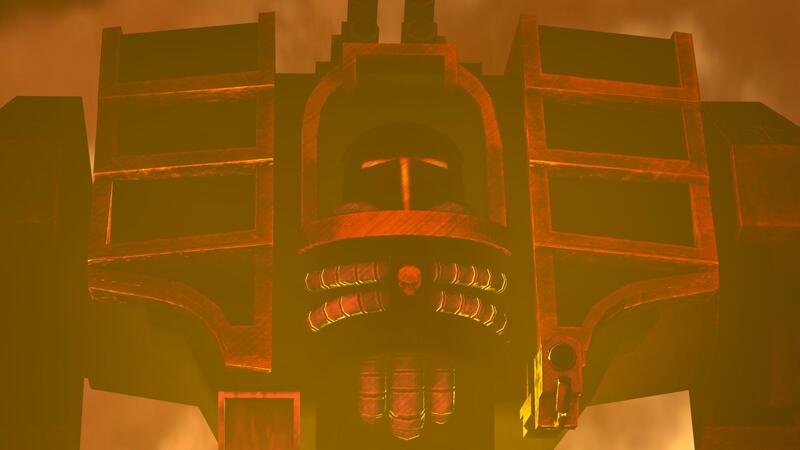 Siege Dreadnaughts (Dreads) are monsterous, heavily armoured, cybernetic war machines, containing the bodily remains of a mortally wounded chaos champion. Dreads can survive a terrific amount of damage, provinging walking cover for their fellow reneagdes, wile laying down walls of smoke and fire. Many Choas dreadnaughts are in constant agony from their cybernetic implants and the influence of the warp blending the mache with what little flesh they have remaining. Suffering combines with the millenia of endless warfare has driven most Chaos Dreadanughts insane. Chaos dreadnaughts are fitted with a pair of anti-tank chainfists than can shred through flesh and armour with ease. Dreadnaughts are also fitted with a torso mounted flamer to sow fire, panic and confusion on the battlefield. Dreadnaughts have the most hitpoints and thickest armour in EX, lead your allies into the thick of battle, burn your foes and carve whatever is left into bloody, smoking chunks. Beware melta, plasma and power weapons as they can penatate even the thickest armour. Dreadnaughts in ex are limited short-ranged weapons for balancing purposes.